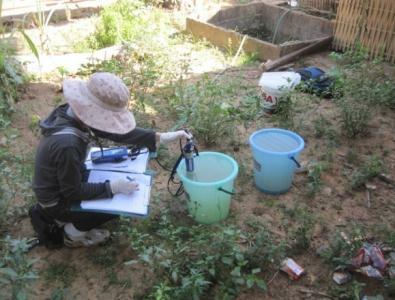 Five groundwater sampling at Ban Sakai (Gold mining site close to a treatment pond), Ban Namthom (potentialcoalmine), Ban Hinlap, Ban Nalat (borehole at the temple) and Ban Viengkham were analysed. Groundwater quality analysis including chemical and pesticides-herbicides parameters (Cu, Cd, Ni, Co, Pb, Zn, As, Hg, CN, Cr6, Ca, Mg, Na, K, SO4, Cl, alkalinity/ acidity, NO2-, NO3- ,chlorpyrifos, glyphosate, paraquat, phenol) were also conducted by ASL Hong Kong. Water samples were collected at each borehole via taps or wells by using hand grab sampler and sample water from hand pumping after stagnant water had been purged for several minutes. Field data sheet was prepared for data recorded and automatically recorded into the probe’s terminal. 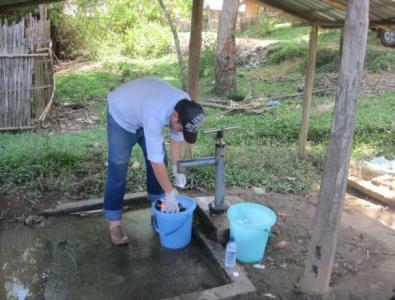 The ground water in The Nam Ton watershed is generally good. The physical and chemical characteristics are in compliance with the standards when exist. 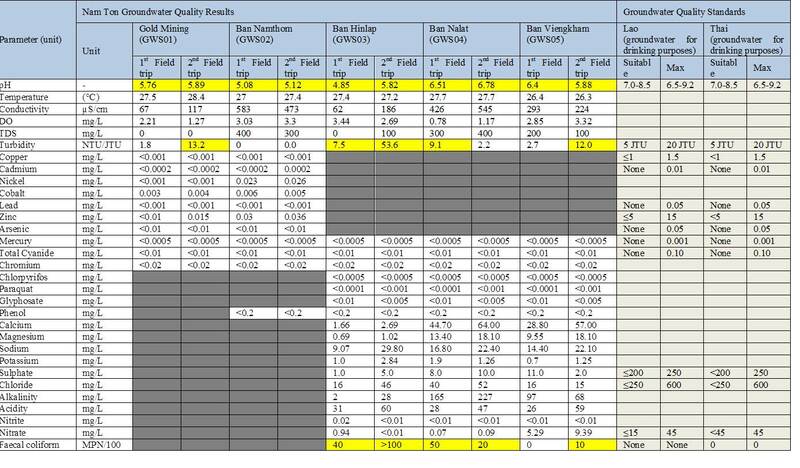 Groundwater from all sites (GWS01-GWS05) in both June and October were quite acidic, pH ranging from 4.85-6.78. In high flow period, sites GWS01and GWS03 which are located adjacent to the gold mine the pH values were acidic. The results of pH at site GWS01, GWS02 and GWS03 were less acidic in October. There will be a potential risk of corrosion of piping acidic water, resulting in rusty-tasting yellow-colored waters. Therefore this water is not suitable for drinking. The value of conductivity is used to estimate the amount of dissolved ions in the water. The conductivity data at five sites range from 62-583 µS/cm.The highest value of conductivity was at Ban Nathom (GWS02). Elevated TDS or ions in water indicate that groundwater might be contaminated by wastewater from septic systems, drainfield on-site wastewater, disposal systems, urban runoff from roads and agricultural runoff (nonpoint source pollutants).TDS values were elevated at site GWS02 and GWS04 in both June and October. The results of turbidity at site GWS03 and GWS04 in June were higher than the standard at 7.5 and 9.1 NTU respectively but lower than the maximum value. In October, the results of turbidity at site GWS01, GWS03 and GWS05 were higher than the standardat 13.2, 53.6 and 12.0 NTU respectively. Groundwater at site GWS03 was turbid water due to a well at this site is not sealed. Usually high turbidity in groundwater could occur from many reasons such as the soil having high permeability, thin soil layer, the water table is close to the land surface and a poorly constructed well. For Copper, Cadmium, Nickel, Cobalt, Lead, Zinc, Arsenic, Mercury Cyanide and Chromium, it is concluded that the amount of metals in the analysed water is non-existent or very close to zero. The results of Nitrate at all sites both in June and October were in compliance with the Lao standard. It seems that groundwater at site GWS05 in Ban Viengkham was higher than other sites that is because this village is surrounded with upland rice cultivation.Leaching of nitrogen form agriculture activities through the soil has caused nitrate concentrations in groundwater. Nitrate is also generated from natural sources, organic sources (human/animal waste discharged in septicsystems and animal yards), atmospheric deposition, and inorganic fertilizer. No sample resulted in levels of pesticides and fertilizers over the instrument detection limits. The results of faecal coliform in groundwater at site GWS3, GWS04 and GWS05 showed enough faecal coliform concentrations to indicate that groundwater might be contaminated by excreta from humans or animals. Therefore chlorination for disinfection is requiredfor these groundwater site locations.